LSU Museum of Art Executive Director Daniel Stetson is shown in the exhibition space for the current Hunt Slonem exhibit. Sometimes the process of putting art on a gallery wall can be almost as intensive as creating the art itself, especially at the LSU Museum of Art. 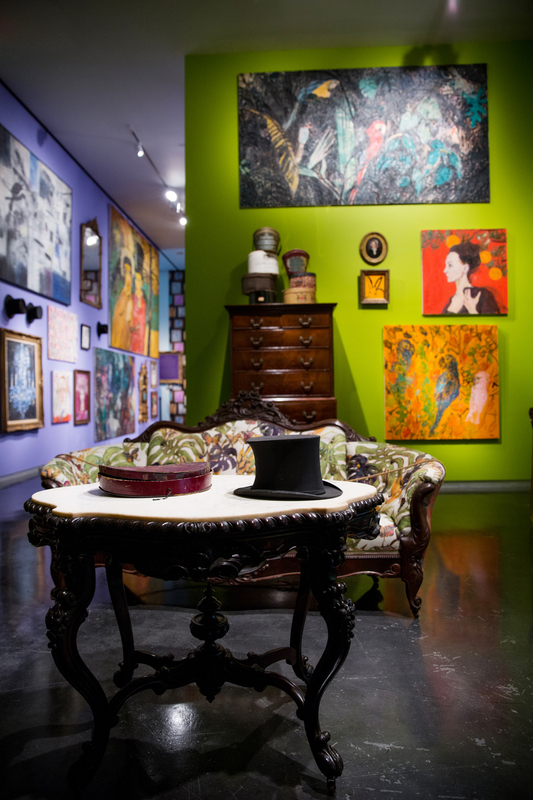 With the recently opened exhibit for Neo-Expressionist painter, sculptor and printmaker Hunt Slonem, the LSU MOA team brings together striking and creative design and dynamic pieces to create a space that feels separated from the rest of the world. Executive Director Daniel Stetson breaks down how the exhibit came together and the process of bringing immersive experiences to the museum. 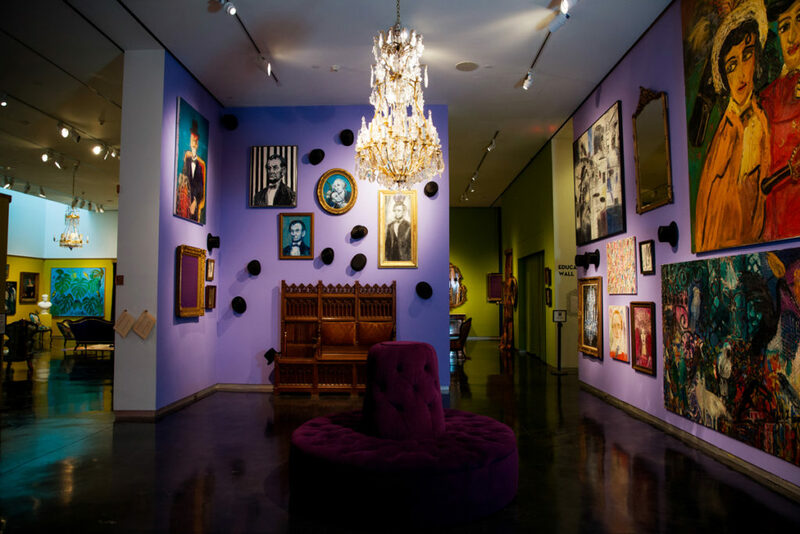 The exhibition space was made to reflect the design and character of Slonem’s own homes, with details such as antique chandeliers and pieces from his top hat collection. What was the vision for the Hunt Slonem exhibit? To give museum visitors an experience like no other museum exhibition. 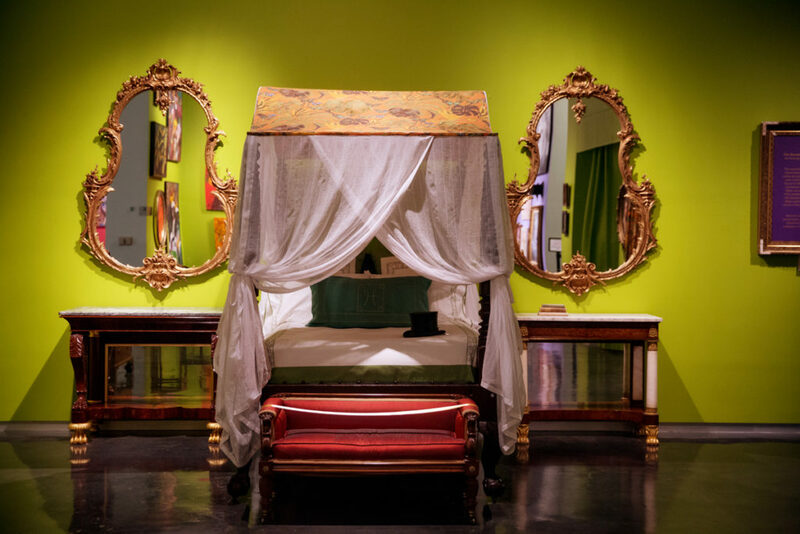 This exhibition was installed to give an impression of the design and character of Hunt Slonem’s Louisiana plantation homes. He has preserved two homes and added his own artistic touch to each by filling them up with antique furniture and objects and unique collections. Additionally, he places his own art in combination with earlier 19th-century portraiture over all the walls. We recreated that feeling in five rooms—an entry room, dining room, living room/parlor, bedroom/boudoir and dressing room. One of the most interesting features is that each room has a unique antique chandelier, which are installed to give the sense of character to each space. A ton of moving pieces—how did they all come together? This was a complicated yearlong process of curation and selection of materials from many lenders in the region and from the artist, too. The coordination of the pickup and delivery and installation of these works is a testament to our hard-working staff, guest curator Sarah Clunis of Xavier University of Louisiana, and many other people [who] assisted right up until the opening. Each room had to be prepared with special paint colors and mouldings and drapes and chandeliers, which had to be put up before we could even begin the complicated process of the installation of the furniture and paintings. How do you think the exhibit reflects and showcases Slonem’s art? This exhibition gives the feeling of visiting someone’s home. The salon-style hanging of works and the artist’s various subjects are explored as a survey of works since the 1980s until now. His various themes are shown—bunnies, butterflies, birds, historic figures, mystics and landscapes amongst them. The very full walls and richly appointed rooms/galleries are a feast for the eyes. What is the key to making exhibitions like this memorable? audiences possible—drives each exhibition’s design and layout. Being creative as museum artists adds fun and purpose to the job, but most importantly adds value and meaning to the work we do. When an installation is done right it looks like no one broke a sweat. Behind the scenes and ahead of time a lot of work goes into a successful installation.